HolyJuan: You will have to wait until morning. 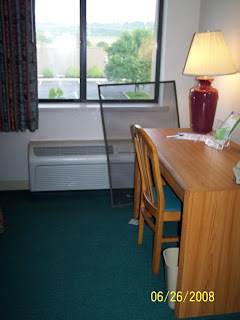 My friend Renee recently stayed at a La Quinta Inn in Mansfield, OH. She, along with her husband and son, had picked up some to go food and were getting ready to eat in the room. The father and son left the room to go get Cokes. 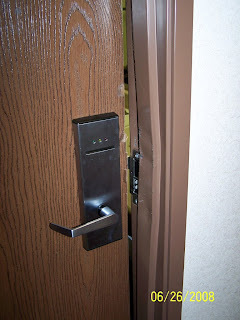 When they came back, the boy was having trouble with the key card so Renee tried to open the door from the inside. As she turned the deadbolt, she heard a loud noise that sounded like the internal mechanisms of the lock dropping. The door would not open. The lock was completely jammed. She was stuck in a third story hotel room. It was 5:00pm. She called down to the front desk and told them the lock on the door was broken. 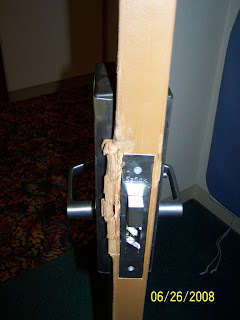 The front desk said they would send maintenance up to fix it. When no one showed up after more than a half hour, she called the front desk again and they said, “Oh? 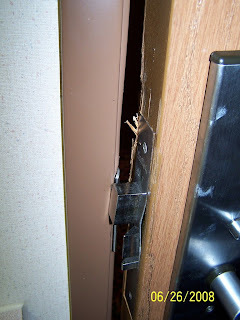 You are locked IN the room?” As it turns out, the maintenance person was not on site and had to be called in. He showed up about another half hour later, fiddled around with the lock for a minute and determined that a locksmith would need to be called in. It was now 6:00pm. Here are the photos of the door. For her troubles, they got a different room, another free night at any other La Quinta Inn and a meal at The Cracker Barrel next door. The hotel told Renee this was only the second time this had happened. I also forgot to mention that they said it was only the second time that had ever happened.